This week has been a week of buzz around Pinterest, the online social pinning board that allows users to pin photographs from across the internet to various boards they create based on their interests. For users, the tool provides a way of expressing themselves, gaining inspiration, and connecting with people from across the globe. For businesses, the tool offers yet another social media tool with which they feel the need to be a part of and are unsure of how to make it work. A few days ago, I offered some tips on how to use Pinterest. Today, I’m going to focus on a business using the tool right- Nordstrom. Nordstrom was one of the early adopters of Pinterest, and I commend them for being at the forefront of the social sphere. 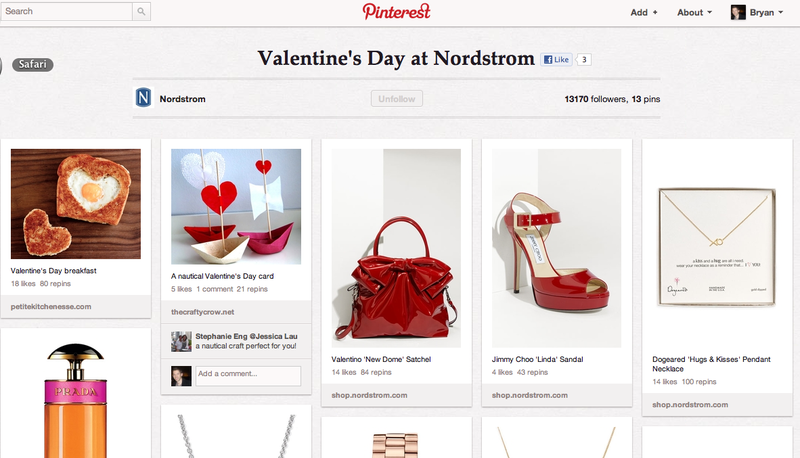 Nordstrom first created their Pinterest page in March of 2011. Since its release, they’ve obtained over 10,000 followers, posted over 430 pins, and created over 31 bulletin boards. Their boards include photographs of the latest trends, wedding dresses for brides, and boards centered around seasonal attire. For example, for Valentine’s Day, Nordstrom created a board dedicated to gifts for a loved one, recipe ideas, and card ideas for the crafty user. 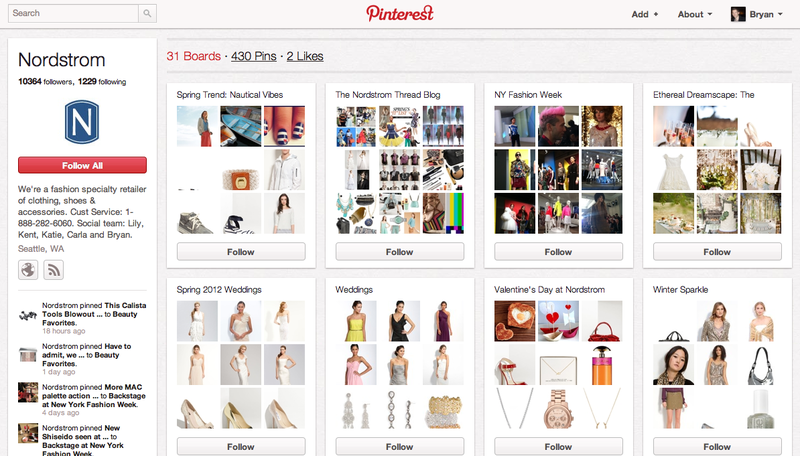 Creating boards such as these helps market promotions, offer style advice, and provide inspiration for followers. All of this is very relevant and useful to those who choose to follow their pins. Besides creating relevant content, Nordstrom is smart about how they pin their photographs. 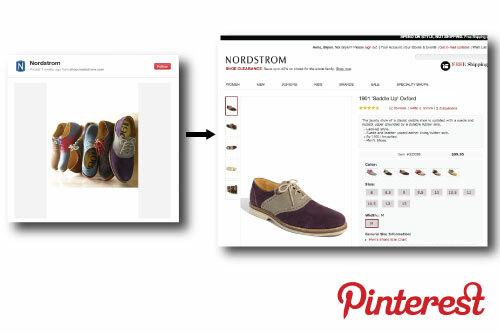 Using the hyperlink function or pinning clothing directly to their site, Nordstrom is able to make Pinterest a part of their e-commerce strategy. All of their pins link directly to the Nordstrom.com ecommerce site, helping to boost online sales. If a user sees a piece of clothing they like, all they have to do is click on the photograph, pick their size, and purchase it. All of these strategic uses has enhanced Nordstrom’s relevance and usability to Pinterest users, helping to truly make Pinterest a strategic marketing tool for their business. Similar strategies can be used by smaller businesses, even those with no e-commerce presence. Link photographs to whatever makes strategic sense to your brand (your website, a page with a contact form, your Facebook page, etc.) and post content relevant to your followers (including content that isn’t solely brand content). Share pins from other Pinterest users and get in with the conversation.